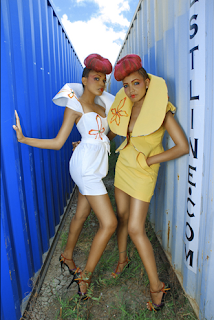 Kimmystic.Clo's 2010 - 2011 Collection photo shoot's location was Rodney Bay, St.Lucia. The inspiration, "The Colors of La Soufriere." The St.Vincent and the Grenadines fashion designer, Kimon Baptiste used Vincentian photographer Nadia Huggins who now resides in St.Lucia. She also used St.Lucian sister-models, Nicole and Bianca DeGale. Kimon Baptiste did the makeup. Her St.Lucian friend Tamara Louis did the hair. The designer states, "a beautiful Vinci-Lucian collaboration which brought my vision to life. I hope you love the end results as much as I do. Enjoy! 18 TRES HOT PHOTOS! I LOVE, LOVE, LOVE!